We recently covered the best women’s running trainers under £100. Now it’s the men’s turn. £100 is a perfectly reasonable budget for a pair of running trainers – and while you could easily spend a lot more than that, you are going to get a very decent pair of kicks for your outlay. Running trainers is an area you should never scrimp on, as a cheap pair or a pair that aren’t specifically designed for running are usually not very well cushioned and this lack of cushioning will cause you no end of problems with injury and strains. We have provided some advice here on picking out a pair of running trainers, particularly regarding the importance of understanding your running pronation, but otherwise let’s dive in. 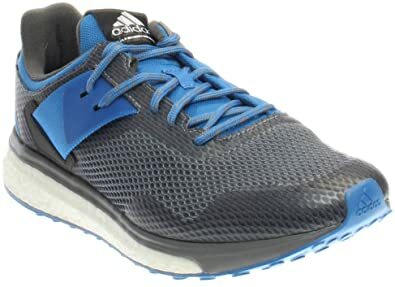 Good solid running trainers from an excellent brand at a very smart price point. 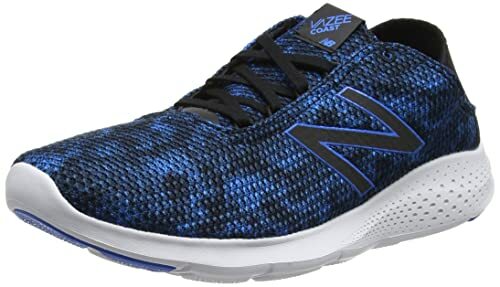 Cushioning may be a little too soft for some and wide footed runners may find them a little tight, but overall a very good pair of trainers. New Balance Vazee’s featured in our top 5 women’s running trainers – so it’s no real surprise to find another pair from the Vazee range making an appearance here in our men’s round-up. 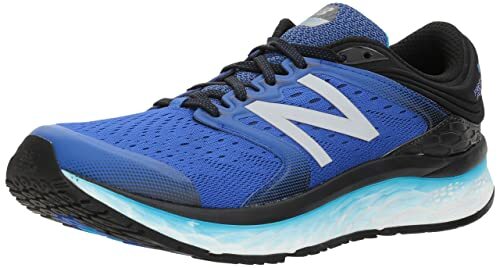 These Coasts have an excellent price point of around £40 and to get trainers from as reputable a running brand as New Balance for that sort of money is nothing short of incredible. These are a neutral shoe and at 227 grams are extremely lightweight. The cushioning is good although possibly a little on the soft side, but overall we found them to be very comfortable. They are available in 2 colours, the blue pictured here but also black if you are the more traditional sort. If you have particularly wide feet then we have read a few reports suggesting that these are a little too narrow. But at the price, they are definitely worth a shot. May be too tight for wide footed runners. Snug running trainers with excellent breathabilty and available in a wide range of colours. May be a little tight in the toe for some. As the name implies, this is the third iteration of the Adidas Response shoe and it looks as if they may have perfected it. The trainers are comfortably snug with no gaping or flapping and the breathable upper kept our feet cool and dry throughout the test run. Adidas is, of course, a world famous trainer brand, although possibly more commonly associated with fashion trainers than road running trainers, but these are a really solid pair of shoes. They are available in 5 different colour combinations from a somewhat gaudy red and purple right through to all black, so you are sure to find something to your taste. On the downside, the toe is a snug fit, which generally wasn’t a problem but could cause discomfort for some runners. Also, we’ve read a couple of reports with concerns about durability, but we didn’t spot anything to concern us. Generally, for the price (around the £50 mark) these represent a good running shoe and would be an astute purchase. Really comfortable trainer with the fresh foam cushioning doing its job nicely. Flexible yet supportive toe and midsole mesh. A little on the heavy side and a little on the expensive side. The second pair of New Balance trainers on the list, although at the other end of the budget. Costing just over £90 these Fresh Foam 1080’s aren’t cheap, but you get a fair bit for your money. Firstly, the cushioning is exceptional (this would the ‘fresh foam’ mentioned in the name), making for a really comfortable run. Secondly, the mesh in the toe and the midsole flexed very well ensuring a snug but comfortable fit, whilst still being extremely supportive. One great feature of these shoes is that they are available in a range of width options, ensuring you’ll be able to find the right fit. In terms of negatives, at 314g it’s a fairly heavy trainer, although how noticeable this would be to the average runner is debatable. Also, they aren’t cheap. Whether they are good value for the money is somewhat in the eye of the beholder, but we feel that they are priced just about right. 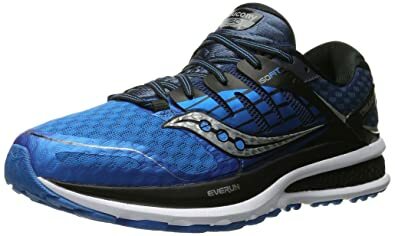 Not everyone may be familiar with the Saucony brand, but in running circles, they are much revered. These Triumph ISO 2’s come with all sorts of patented features such as ISOFIT, RUNDRY, EVERUN and PWRGRID. But in layman’s terms, we found these to be very supportive and very well cushioned. Which of course you would expect when you consider that the RRP is £140 (they are included on this list by virtue of the fact that they can easily be picked up at just under the £100 mark). The toe box is roomy which may not be to everyone’s tastes if you prefer a very snug fit, but breathability and moisture wicking was extremely good. While the toe is roomy, the uppers were a little bit narrow – this would tie in with a few reports we’ve read where users have suggested that you should order a size up from your usual fit. 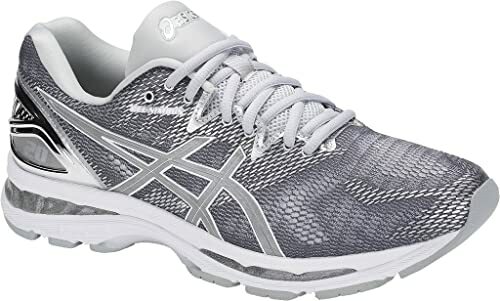 While these Asics trainers come in just over budget we think they are worth it with incredible gel cushioning and a near perfect fit. Could be a bit stiff for some and are undeniably on the expensive side. These actually tip the scale at just over £100 (£103 was the best price we found at the last check) so we’re cheating a tad here, but they are too good not to include. The gel cushioning is really incredible and did a great job of providing a comfortable yet supportive run. We found the fit to be near perfect first time and these trainers look the business too and are available in several different colour combinations. They are somewhat heavy at 303 grams and are a little on the stiff side with not a huge amount of flex going on. And as they actually nudge us over the budget, we can’t deny that they are a bit expensive – but overall we think that anyone would be satisfied if they picked up a pair. A bit expensive and just a tiny bit over the budget.